« C.J. Spiller’s role in the Bills offense – full-time wide receiver? The Buffalo Bills had a golden chance to head into their bye week on a dual high note: at 5-1 and tied in the AFC East with the New England Patriots. Neither one happened on Sunday. The Bills lost while the Patriots slipped past Dallas and go into the bye as the AFC East leaders. Still, at 4-2 Buffalo appears to be in far better shape after six games this year than they were a year ago. While disappointing, the loss doesn’t mean the sky is falling. It does, however, mean the Bills must be ready to get down to business once they return to action in Toronto in two weeks against Washington. – Ahh, the life of an NFL quarterback. You get the praise when you lead your team to victory and you shoulder the brunt of the blame when you come up a few throws short. That’s the case for Ryan Fitzpatrick on Sunday. His day will be remembered for two badly underthrown balls in the direction of Stevie Johnson that were picked off by Corey Webster, the biggest coming with under four minutes left in the game with the Bills and Giants tied at 24. Buffalo was at the New York 27 looking at no worse than a field goal attempt, but instead Fitzpatrick’s interception led the Bills to come away with nothing. The Giants went down the field and kicked the eventual game-winning field goal. – It was a day to forget for Drayton Florence. Arguably the Bills’ best corner, he had his worst game of the season. Florence was flagged for three pass interference penalties for a total of 45 yards. Two of those three flags game on the Giants’ final and game-winning scoring drive in the last minutes of the game. He was also burned deep down the sideline by Giants WR Hakeem Nicks for a 60-yard catch. – Buffalo’s defense limited New York to just three points in the last 22:07 of the game, definitely giving the Bills a great chance down the stretch to steal a victory on the road. – The downside, however, remains the fact that just as Shawne Merriman’s achilles continues to trouble him, Buffalo’s absence of a pass rush continues to be their defensive achilles heel. They barely sniffed Eli Manning, who threw for 292 yards. Despite not throwing for any touchdowns, Manning was able to sit back rather calmly in the pocket and dictate where he wanted to go with the football. I know the Bills’ defense was shorthanded without Merriman, Chris Kelsay and Kyle Williams. But those blitzing packages they utilized so well against Philadelphia a week before weren’t implemented on Sunday. I don’t know where or if they’ll find a pass rush the rest of the season, but it’ll be difficult to take Buffalo seriously as a playoff contender if their defense cannot get after opposing quarterbacks. 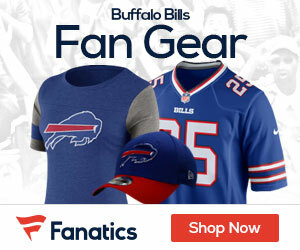 – Have the Bills finally found a way to effectively use C.J. Spiller? The jury’s still out, but Spiller caught all five passes thrown his way and moving forward, it’s likely he’ll remain as a wide out at least until Donald Jones returns later in the season from a high ankle sprain. He’s far from what we’d call a polished receiver or route-runner, but he’s got one element to his game that’s an asset and that’s his speed. When he touches the ball, he becomes a potential threat if he can elude the first defender and get to the second level of the defense. – Doesn’t it figure that Chris Hairston plays fairly well and then suffers an injury that will likely keep him out until November? 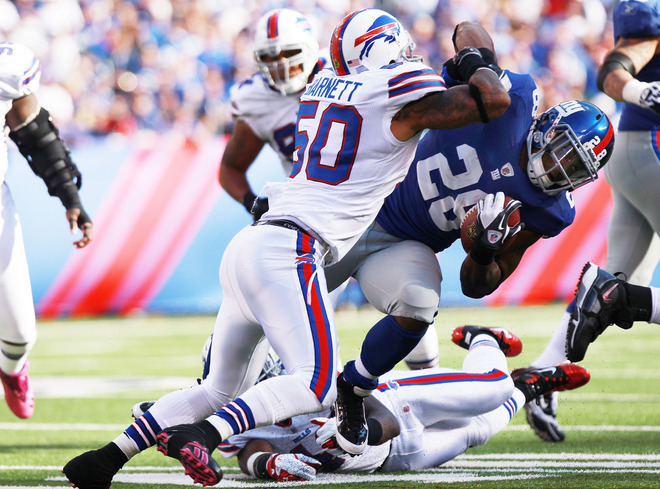 Hairston was injured late in the game when Giants DE Jason Pierre-Paul fell on the back of Hairston’s leg and rolled up on him. He gave up two sacks on Sunday, but neither were the rookie’s fault. Both were coverage sacks and both instances Fitzpatrick needed to get rid of the ball, held onto it too long and took sacks. If Demetrius Bell isn’t ready to return after the bye, one of Buffalo’s biggest preseason fears will be coming true: testing their depth along the offensive line. – Fred Jackson. I mean, need I say more about this guy? Ok, I will. Easily the team’s MVP the first six weeks. I don’t want to think where Buffalo would be without him. He finished the day with 121 yards and a beauty of an 80-yard touchdown run zigging and zagging away from numerous Giants defenders. – One thing I absolutely didn’t like: after the second half, Jackson had only seven carries for 18 yards. It seemed like the Bills got away from the run too much in the second half. I’m not sure why. The largest deficit they faced was seven points in the second half. They were in the game the entire way, and with the way the Giants have had their struggles on defense against the run, I was highly disappointed Jackson didn’t get more opportunities and more touches in the second half. – Now, about the Fitzpatrick second INT and the play calling by Chan Gailey. My initial reaction following David Nelson’s big 32-yard reception that got the Bills inside the New York 30. The very next play, Fitzpatrick threw his second INT of the game and it was the turning point in the game and not in a good way for Buffalo. I think it’s fair to ask why at that point Gailey didn’t turn to the running game to try and seal the deal. Already at the Giants’ 27, I thought for sure at that point the game plan would’ve been to utilize Jackson and attempt to keep the ball away from Manning and the Giants offense. I don’t necessarily like the call to have Fitz throw, but I understand it. It would’ve been very difficult for the Bills to run off the final four minutes, and there were no gurantees they’d score a touchdown or even get in a better position to kick the go-ahead field goal. Gailey’s not one to play it conservative and perhaps with over four minutes left, that would’ve been way too early in the game to go close to the vest. The Giants still had two timeouts plus the two minute warning. Gailey wanted to be aggressive and I don’t have a problem with that at all. Fitz should’ve made the throw. Plus, if you have to send the defense back out there at the end of the game with a lead, I’d much rather have it be a seven-point lead than a three-point lead. What’s Next – Buffalo heads into their bye week and won’t return to action until Oct. 30 for their Toronto “home” game against the Washington Redskins. Great synopsis. Fred “Don’t call me Michael” Jackson seems to get better by the week. I wonder how good this squad could be if we could get some pressure on opposing quarterbacks.